Very loosely adapted from the book by Max Brooks (spawn of Mel Brooks and Ann Bancroft) World War Z stars Brad Pitt as United Nations employee Gerry Lane as he does a little globe trotting in a race stop the impending doom of the Zombie pandemic. Seriously... what more do we really have to say about this flick? Brad Pitt loved the book so much that his own Plan B Entertainment secured the rights after a bidding war with Leonardo DiCaprio's production company, Appian Way. They filmed all over the globe and for a PG-13 movie it's supposed to be a nasty little gore-fest (done in the most tasteful of ways of course). To get a full on perspective of the original intent for World War Z check out this lecture given by Max Brooks from the U.S. Navel War College. Will the flick stand up to the original intent of the book? Do each stand on their own merits? We would love to hear what you think! Add your two cents to the comments section below and let us know what you think! 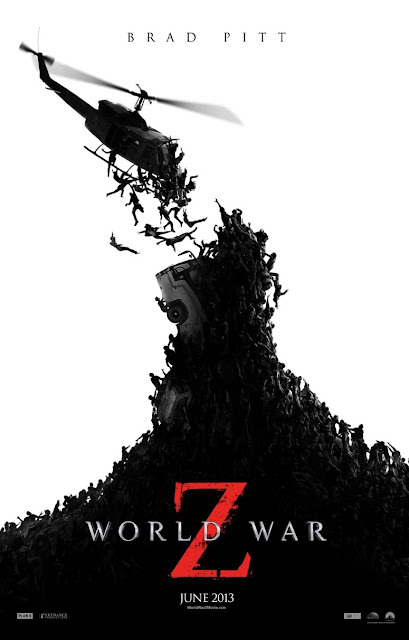 World War Z starts today in a theater near you. Also, don't forget to check out the Official Max Brooks Website for more on World War Z, the Zombie Survival Guide, and Recorded Attacks!